Wind power is energy, such as electricity, that is generated directly from the wind. It is considered a renewable energy source because there is always wind on the Earth and we aren't "using up" the wind when we make energy from it. Wind power also does not cause pollution. In order to make electricity from wind, energy companies use large windmills called wind turbines. They are called this because they use turbine generators to generate the electricity. In order to create a lot of energy capable of powering thousands of homes, energy companies build large wind farms with lots of wind turbines. They usually build these in consistently windy places. Some companies build wind farms out in the ocean. These are called offshore wind farms. Wind turbines are really big structures. The tower itself is typically between 200 and 300 feet tall. When you add in the height of the blades, some turbines tower 400 feet high! The blades are quite big, too. There are typically three wind blades on a wind turbine. Each blade is usually between 115 and 148 feet long. A wind turbine works the opposite of a fan. Instead of using electricity to turn the blades to make wind, it uses the wind to turn the blades to make electricity. When the wind turns the blades, the blades turn a shaft inside the turbine. This shaft is big, but turns slowly. 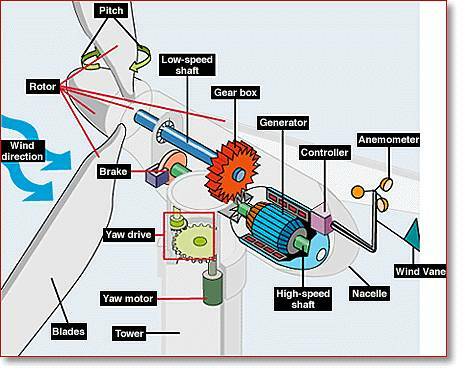 The shaft, however, is connected to a number of gears which causes a smaller shaft to turn much faster. This smaller shaft drives the electrical generator which generates the electricity that can be used by homes and businesses. What if there isn't any wind? If there isn't any wind, then no energy will be generated by the wind turbine. However, engineers do a lot of measurements and calculations to figure out the best areas to place the wind turbines. The wind won't be blowing all the time, but the important thing is how much the wind blows on average. Windmills have been used since the Middle Ages in order to harness the energy of the wind. They were initially used to pump water or to grind flour. They are still used in many places of the world today to pump water. It was in the late 1800s and early 1900s that windmills were first used to generate electricity. Are there any drawbacks to wind power? One major issue some people have with wind power is how the wind turbines mess up the view or landscape. Other drawbacks include the large blades killing birds and noise pollution from the turbine. Most people agree that the positives of a fully renewable and clean energy resource far outweigh the negatives. For a wind turbine to make money it must be placed in a spot with an average annual wind speed of 15 miles per hour. In 2011, the top wind power producing state in the United States was Texas. Texas was followed by Iowa, California, Minnesota, and Illinois. 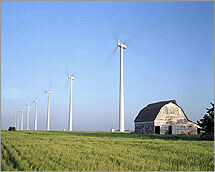 Around 3% of the electricity in the United States in 2011 was provided by wind power. This was enough to power around 10 million homes. Tax breaks and new technologies have helped the output from wind power to grow significantly in the last 10 years. The largest wind farm in the United States is the Horse Hollow Wind Energy Center in Texas. It has 421 wind turbines.